as low as † $ /mo. 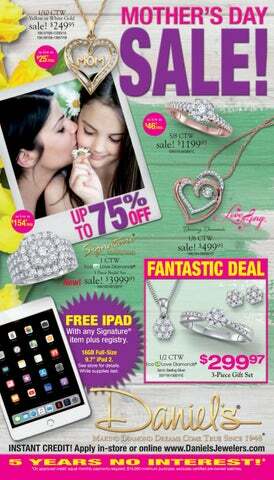 FREE IPAD With any Signature® item plus registry. 16GB Full-Size 9.7” iPad 2. See store for details. While supplies last. 5 YEARS NO INTEREST! * *On approved credit; equal monthly payments required; $10,000 minimum purchase; excludes certified pre-owned watches. GIFT CARD with any jewelry purchase of $149.95 or more. See store for details. 1/10 CTW Available in Rose, White & Yellow Gold. 9997 Sorry, no additional discounts allowed. Sorry, no additional discounts allowed. SS/119-05007/3M Sorry, no additional discounts allowed. Diamond Jewelry For Your Promise of Love & Commitment to Each Other. Every Love Song Diamond Promise Ring is distinguished by a Pink Sapphire which is embedded in the band and is presented in an attractive jewelry box. Text Daniels to 72727 for special offers, discounts and more. Available in Rose, White & Yellow Gold. NO CREDIT NEEDED Only $49 DOWN • UP TO $3000 CREDIT LINE • BRING YOUR CHECKING ACCOUNT INFORMATION. YOUR CHOICE as low as † $ /mo. GIFT CARD with any jewelry purchase of $149.95 or more. YOUR CHOICE Matching Earrings Available. 179995 YOUR CHOICE as low as † $ /mo. Daniel’s Signature Collection features the finest craftsmanship & exquisite diamonds individually selected for brilliance & value. 16GB Full-Size 9.7” iPad 2. See store for details. While supplies last. With any Signature item plus registry. Each EGL USA and GHI Certificate Diamond ring is LASER INSCRIBED on the girdle with a Report Number. Choose the size that suits your individual taste and budget. 16GB Full-Size 9.7” iPad 2. We have an endless selection of special order diamonds available in just 48 hours. Including Mined, Lab Grown and Colored Diamonds. Come in today and let us help you find the Diamond of Your Dreams! STORE POLICY: Reference prices referred to throughout this mailer are our actual ticket prices unless otherwise specified. Sales may or may not have yet been made at these ticketed prices. Many items throughout this catalog are pictured larger than actual size to show detail. Some items, including diamonds, may be enhanced or modified for photographic purposes and actual merchandise may vary from that shown. Diamond carat weights (CTW) represent the approximate total weight of all diamonds in a piece. Unless otherwise specified, all diamonds can be assumed to be mined though lab-grown diamonds could inadvertently be substituted by the manufacturer. Prices shown in this catalog were accurate as of the date of printing though commodity fluctuations could lead to increased prices. † Terms shown are based on no prior balance and approval by an independent credit provider and assume a 10% down Payment. Daniels also offers its own-in-house financing, but payment terms may be different from those shown. * Offer applies to single-receipt qualifying purchase. No interest will be charged on the promo purchase if you pay if off in full, within the promo period. If you do not, interest will be charged on the promo purchase from the purchase date. The required minimum monthly payments may or may not pay off the promo purchase by the end of the promo period. Regular account terms apply to non-promo purchases and, after promo period ends, to the remaining promo balance. For new accounts: Purchase APR is 29.99%. Minimum interest charge is $2. Existing cardholders: See your credit card agreement terms. Subject to credit approval. Love Diamonds® : Lab grown diamonds that are physically and optically identical to mined diamonds. Only available in Princess-Cut and Round. Choose Round or Princess Cut in the size to suit your taste & budget. Diamond Wedding Jewelry For The Music in Your Heart. sale! $99995 YOUR CHOICE as low as † $ /mo. A Bridal Set for Her, A Wedding Band for Him. as low as â&#x20AC; $ /mo. Scan this QR Code to shop our mobile website. Certified by Swiss Crown USA. Now Available in Select Stores! Daniel’s Jewelers and Swiss Crown USA and affiliates, are not an authorized dealer or service center nor affiliated with, endorsed or sponsored by Rolex Watch UDA inc. and none of the Swiss Crown USA LLC products are sold, distributed, offered and/or certified by Rolex Watch USA Inc. Comfort Feel ® as low as † $ /mo. Special Order (Sizes 3-15) Check store for prices. 95 as low as † $ /mo. A History of Firsts FREE Perfume Free with any Bulova or Wittnauer watch with a Manufacturerâ&#x20AC;&#x2122;s list price of $395 or more. Merchandise may be enlarged to show detail and may not always be exactly as pictured. Merchandise may not be available in all stores. All Bulova watches have a three-year limited warranty. and Bulova are registered trademarks. Swarovski is a trademark of Swarovski AG. See Our Complete Selection of Ladies’ Watches. FREE EAR PIERCING & 14K Gold Studex® Starter Studs! Ask a Daniel’s Associate for Details. * Clutches are 14K Gold Filled. For already pierced ears. Cut off for Mother’s Day – April 28th. Text from your smart phone in our stores! Flawless, exquisitely cut Cubic Zirconia finely crafted in precious metals. Sterling Platinum guaranteed for life. FEB MAR APR MAY JUN JUL AUG SEP OCT NOV DEC Sorry, no additional discounts allowed. with a $49.95 minimum purchase. Limit one per household with original coupon while supplies last. Must be 18 years or older. Sorry, no rainchecks. We make every effort to have adequate stock but reserve the right to substitute another item. Expires 5/12/19. SKU 543-03334. Also available in size 6 & 8. 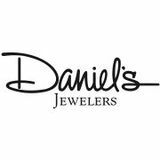 Daniel’s BONUS Coupon ALL 3 PAIRS! G59 Copyright 2019 Sherwood Management Co., Inc. Prices effective through May 12, 2019.